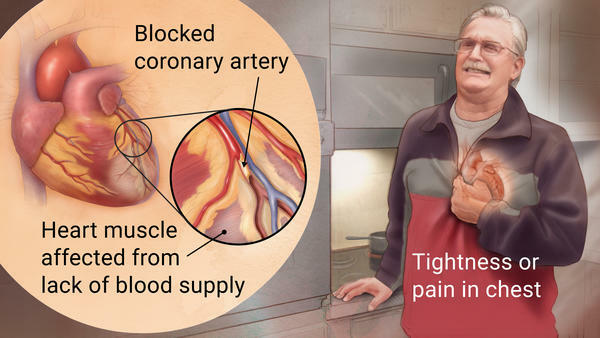 Acute myocardial infarction (acute MI) refers to what is commonly called a “heart attack” and belongs to the broader category of diseases that are refereed to as ischemic heart disease. During an MI, the myocardium of the heart is ischemic for so long that there is some degree of irreversible damage due to the necrosis of myocardial cells. It is important to appreciate that there are different types of MIs. Subendocardial infarction occurs in the initial phases of an MI. It involves less then 50% of the myocardial wall thickness (usually only the innermost layer of the heart which is the furthest from the blood supply). Continued ischemia can lead to transmural infarction. Given an MI is defined by the irreversible damage of the myocardium, the ability of the heart to pump blood is compromised by this disease process. The cardiac wall often is dysfunctional post MI. Chest pain that is severe and crushing in nature. Radiates to the left arm/jaw. NOT releived by administration of nitrates like nitroglycerin. Very short (few seconds) of pain. Radiation of pain to the lower extremities. ST Depressions can be seen with with an NSTEMI and are typically associated with subendocardial MIs. T wave inversions are also associated with subendocardial MIs. Pathologic Q waves can be seen with transmural MIs. Elevated cardiac biomarkers are diagnosis of an MI. Troponin I is the most sensitive and specific marker (gold standard). Stays elevated for ~ a week. CK-MB can detect reinfarction that occurs days after initial MI (it returns to normal ~72 hours after initial infarction). The EKG and ultimately the cardiac biomarker lab tests can help identify an MI given the broad differential diagnosis that can surround the presentation of acute chest pain. 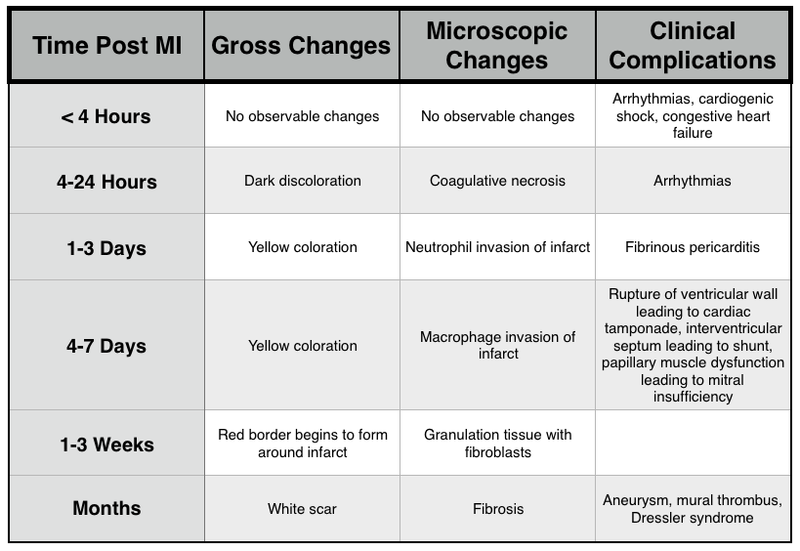 Management of MI is complicated and depends on a few factors (i.e. STEMI vs. NSTEMI). The below is a generalization. Chair/bed rest with continuous EKG monitoring. Heparin to further prevent coagulation. Invasive treatment strategies may be required in some patients. This involves cardiac catheterization and angioplasty in order to re-vascularize ischemic portions of the myocardium. 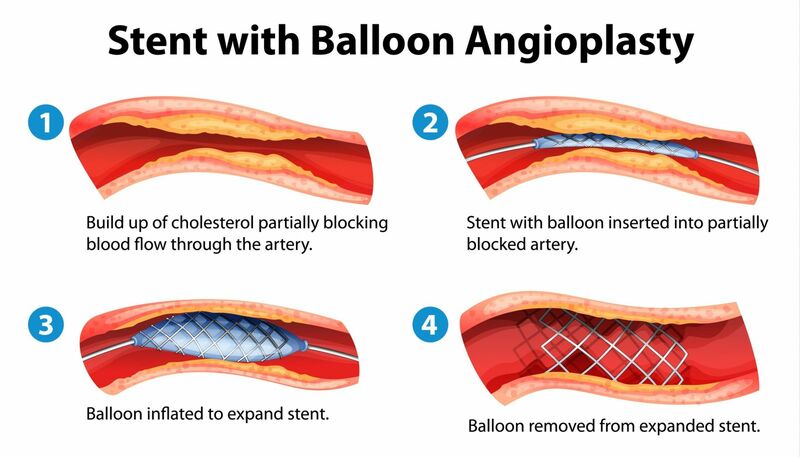 Fibrinolysis can open the blocked vessel in some instances and sometimes is an alternative to angioplasty. Agents such as tissue plasminogen activator (tPA) are used. Outcome is variable and depends on the extent of myocardial damage. Often patients may die as a result of an MI or related complications. Preventing coronary artery disease (proper diet and exercise) will in part help prevent MI and other forms of heart disease. Contraction band necrosis occurs when irreversibly damaged cells are reperfused. This leads to an influx in calcium, causing hyerpcontraction of myofibrils. Reperfusion injury can occur when the return of oxygen and inflammatory cells to the myocardium generates free radicals further damaging myocytes. Arrhythmias: these can be fatal and are a common cause of death immediately during the MI (and even weeks afterward). Ventricular tachycardia can be a consequence of an old scar from an MI that causes abnormal conduction and a re-entry circuit into the ventricle (which ultimately causes rhythmic depolarization of the ventricles). Class IB sodium channel blockers can be used for this condition post MI. Mitral regurgitation can be a result of papillary muscle rupture after an MI. The chord tendineae no longer function to prevent regurgitation under these circumstances. Ventricular free wall rupture can occur ~3-7 days after an MI. This will cause bleeding it not he pericardial, ultimately resulting in pericardial tamponade and death. A ventricular pseudoaneurysm can form when a free wall rupture is contained. This will decrease cardiac output, increase the risk of an arrhythmia, and mural thrombus emboli can form (~3-14 days post MI). Fibrinous pericarditis: within the first week post MI, inflammation from the necrosis of the myocardium can increase vessel permeability and exudate formation. Directly caused by inflammation. Ventricular aneurysm: a later complication (occurs months after MI) where wearing of the ventricular wall leads to dilation and fibrosis without rupture. This complication takes time simply because the fibrosis takes time to occur. The dilated fibrotic area of the heart cannot contract, and ultimately leads to congestive heart failure. Clots can also form along the wall of the ventricle (mural thrombus) due to the stasis of blood (these can become emboli). Dressler syndrome (autoimmune fibrinous pericarditis): as the myocardium dies, cellular contents foreign tot he immune system are pleased and the body may develop an auto-immune response to them. This can lead to an autoimmune pericarditis ~1-2 months after the MI. LAD is the most commonly occluded coronary vessel. Blockage of this vessel leads to infarction of the anterior wall/anterior septum of the left ventricle. RCA is the second most commonly occlude vessel. Blockage of this vessel leads to infarction of the posterior wall/septum and papillary muscles of the left ventricle. LCX occlusion leads to infarction of the lateral wall of the left ventricle. After an MI what was once functional myocardium is then replaced with scar tissue. Infarction generally involves the left and right ventricles (both atria are commonly spared).